Rub-a-Dub-Dub, the Three Men In A Tub set was a toy designed to depict the famous nursery ryhme. The set uses a round yellow plastic tub and 3 weighted figures: the Butcher, the Baker, and the Candlestick maker. The tub base had 3 different variations during the 15 years of it's production. The figures remained basically the same, with the exception of the Candlestick maker whom comes with a blue or yellow base. The first year that this set was introduced, 1970, the Fisher-Price Dealer's catalogue pictures the three figures with black shoe prints on the front of their body, however all of the figures that we have ever seen simply have the shoe imprints that match the color of the figure's body. If anyone has a Butcher, Baker or Candlestick maker with black shoe imprints, please send a picture to us at: info@thisoldtoy.com. Fisher-Price introduced the #142 Three Men In A Tub set in 1970, and the set was discontinued in 1985. The #142 was the only set that used these figures. The figures are approximately 4 inches tall, and 2-3/4 inches wide across the base. Body Color: White body with a black weighted base. Other Features: Baker has a round red nose, a crooked mouth, and two black dot eyes. This is the same as FPT14301 (below) except the color of the weighted base. Body Color: White body with a blue weighted base. This is the same as FPT3643 (above) except the color of the weighted base. Body Color: Red body with a black weighted base. The Candlestick Maker has a round red nose, a black dot mouth, and two black dot eyes. This is the same as the Candlestick Makers below, except the color of the weighted base. Body Color: Red body with a blue weighted base. This is the same as the Candlestick Maker above and below, except the color of the weighted base. 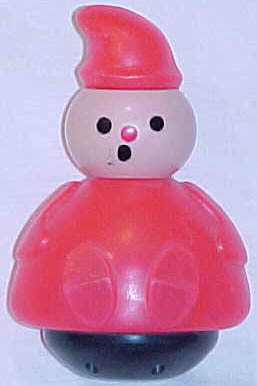 Body Color: Red body with a yellow weighted base. This is the same as the Candlestick Makers above, except the color of the weighted base. Body Color: Yellow body with a blue weighted base. Other Features: Butcher has a round red nose, a black moustache (no mouth), and two black dot eyes.